At the end of the fiscal year, you must complete a stock-take in order to value your inventory. This article explains how to make stock adjustments in your free POS software Hiboutik. Before any valuation of your inventory, you must check you have an accurate inventory level in your POS system, otherwise you should complete some stock adjustments. Unfortunately there is no shortcut, you must count item by item and compare quantities with your expected inventory. But you don’t need to wait for the last day of your fiscal year to complete your stock-take. You can anticipate your inventory counts. When you complete a count if there is a difference between the counted quantities and your expected inventory, the gap is saved until you close your inventory count. In Hiboutik, it is not compulsory to proceed to a full count, you can complete partial stock-takes (on some items) regularly during the year. – and Close inventory counts. 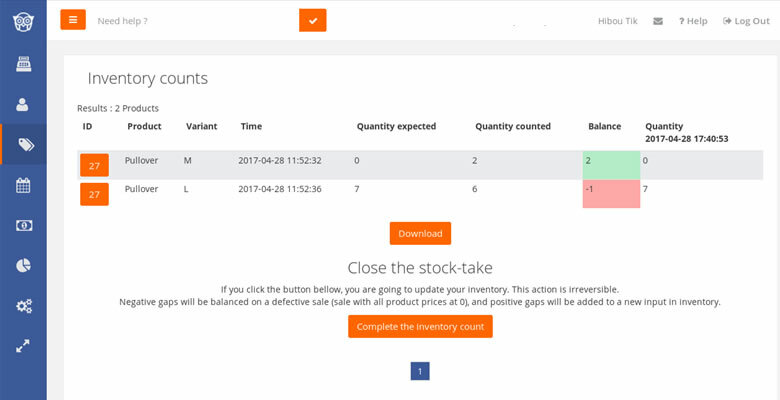 In the Products tab of your Hiboutik account, you will find in front of each item the inventory count icon ( ). When you click on it, you can fulfill a chart with your counted quantities for all variants of the item. Any difference between counted and expected quantities is carried forward into the variance report in Products/inventory counts. Once your stock-take is done, all differences are registered in Products/Inventory counts. – For positive differences (when counted quantity is higher than expected quantity), a stock order is automatically created and submitted (supply prices are the ones fulfilled in the product forms). 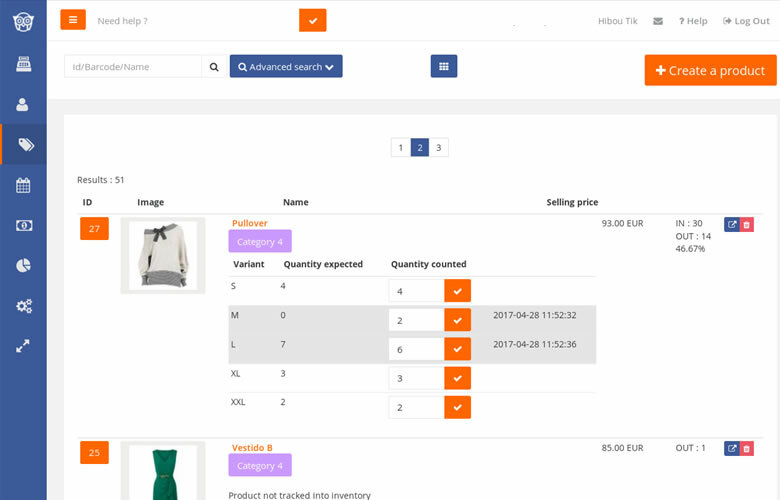 – For negative differences (when counted quantity is lower than expected quantity), a sale is automatically created with all the unavailable products. Prices in this defective sale are turned to 0, and the sale is closed. In the note of the sale, a valuation of the loss (at the supply price of items) is calculated. To better track your shrinkage, we advise you to link this defective sale with a specific customer (like “unknown shrinkage”). 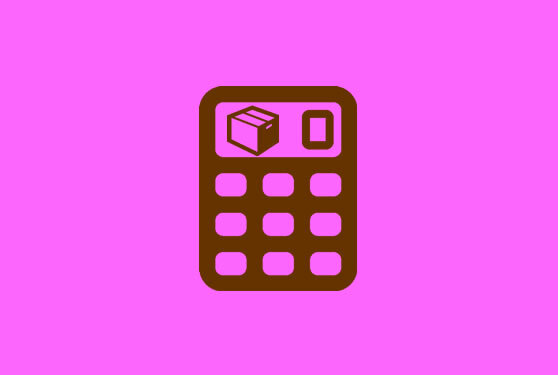 If you download your product database (Search your product database and select “Create an export file”), you can calculate an estimate valuation of your inventory (at the supply prices fulfilled in your product forms). If you have subscribe to the Premium option, you can find a more accurate valuation of your inventory in Reports /Stock. The method of valuation is FIFO (first in first out) so it takes into account the changing supply prices of your products. You can value your inventory whenever you want, so in January you can get a valuation of your inventory for the 31st of December of the past year. Your stock-take differences are registered the day when you close your inventory count. So if you submit your inventory count before midnight the 31st of December, the differences will be taken into account in the valuation of your inventory the 31st of December. Otherwise, you will have to make an accounting treatment to have an accurate valuation of your inventory for the 31st of December. In the Reports tab you can find all information to better track your business and improve your profitability.